"Baneberry" redirects here. For the community in the United States, see Baneberry, Tennessee. For the botched nuclear test, see Yucca Flat § Baneberry. Actaea, commonly called baneberry, bugbane and cohosh, is a genus of flowering plants belonging to the family Ranunculaceae, native to subtropical, temperate and subartic regions of the Europe, Asia and North America. The genus was redefined to include Cimicifuga and Souliea in the 1990s (Compton et al. 1998, Compton & Culham 2002, Gao et al. 2006, RHS Plant Finder, 2007) based on combined evidence from DNA sequence data, similarity in biochemical constituents and on morphology returning it to the original Linnean concept of the genus. The number of species in Actaea is to 25-30 using this concept. Other botanists (e.g., Hoffman 1999, Wang et al. 1999, Lee & Park 2004, Wang et al. 2009) reject this merger because only one group (Actaea) have fleshy fruit while the remainder have dry fruit. However, this narrower generic concept works for only a single morphological character and other characters such as number of carpels moves the generic boundary. The genus is treated here in its broader sense. The Plant List lists 30 species, and does not list Cimicifuga separately but treats it as a synonym. Actaea is derived from the Greek name for elder (Sambucus); it was named by Pliny because the leaves of Actaea and Sambucus are similar in appearance. The name Actaea alba (L.) Mill. is a confused one (Fernald 1940); although described as an American species (now named A. pachypoda), the illustration on which the description was based was actually a picture of the European A. spicata, and strictly, the name is therefore a synonym of the European species. Some texts, however, still treat A. pachypoda under this name. Baneberry contains cardiogenic toxins that can have an immediate sedative effect on human cardiac muscle. The berries are the most poisonous part of the plant (hence the name baneberry). Children have been poisoned by eating the waxy, shiny red or white berries. Ingestion of the berries can lead to cardiac arrest and death. It is toxic to rabbits. The berries are harmless to birds, the plant's primary seed disperser. Actaea species are closely related to plants in the genus Aconitum, a highly toxic plant genus which contains wolfbane and several varieties of monkshood. The roots of A. rubra contain β-sitosterol glucoside, and they were used medicinally by Native Americans as an alternative to Black Cohosh, (A. racemosa), for menstrual cramping and menopausal discomfort. Actaea is recorded as a food plant for the larva of the Dot Moth. ^ Wang et al 2009. ^ Ali, Zulfiqar; Khan, Shabana; Khan, Ikhlas (2006). "Phytochemical Study of Actaea rubra and Biological Screenings of Isolates". Planta Medica. 72 (14): 1350–2. doi:10.1055/s-2006-951696. PMID 17024608. Compton, J. A.; Culham, A.; Jury, S. L. (1998). "Reclassification of Actaea to Include Cimicifuga and Souliea (Ranunculaceae): Phylogeny Inferred from Morphology, nrDNA ITS, and cpDNA trnL-F Sequence Variation". Taxon. 47 (3): 593–634. doi:10.2307/1223580. JSTOR 1223580. Compton, James A.; Culham, Alastair (2002). "Phylogeny and Circumscription of Tribe Actaeeae (Ranunculaceae)". Systematic Botany. 27 (3): 502–11. doi:10.1043/0363-6445-27.3.502 (inactive 2018-09-06). JSTOR 3093958. Compton, J.A. ; Culham, A.; Gibbings, J.G. ; Jury, S.L. (March 1998). "Phylogeny of Actaea including Cimicifuga (Ranunculaceae) inferred from nrDNA ITS sequence variation". Biochemical Systematics and Ecology. 26 (2): 185–197. doi:10.1016/S0305-1978(97)00102-6. Fernald, M. L. (1940). "What is Actaea alba?". Rhodora. 42: 260–5. Gao, Jing-Chun; Zhang, Jin-Chao; Lu, Zhi-Jian; Zhu, Guo-Yuan; Yang, Meng-Su; Xiao, Pei-Gen (2006). "Chemical constituents of Actaea asiatica Hara and their anti-osteoporosis activities". Biochemical Systematics and Ecology. 34 (9): 710–13. doi:10.1016/j.bse.2006.02.004. Hoffmann, Matthias H. (1999). "The phylogeny of Actaea (Ranunculaceae): A biogeographical approach". Plant Systematics and Evolution. 216 (3–4): 251–63. doi:10.1007/BF01084402. Lee, Hyun-Woo; Park, Chong-Wook (2004). "New Taxa of Cimicifuga (Ranunculaceae) from Korea and the United States" (PDF). Novon. 14 (2): 180–184. JSTOR 3393313. Wang, Wen-Tsai; Li, Liang-Qian; Wang, Zheng (1999). "Notulae de Ranunculaceis sinensibus (XXIII)". Acta Phytotaxonomica Sinica. 37 (3): 209–19. Archived from the original on 2012-04-25. The Plant List (2013). "The Plant List Version 1.1". Royal Botanic Gardens, Kew and Missouri Botanical Garden. Retrieved 7 July 2015. 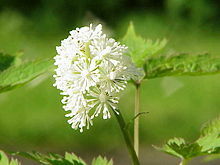 Wikimedia Commons has media related to Actaea.